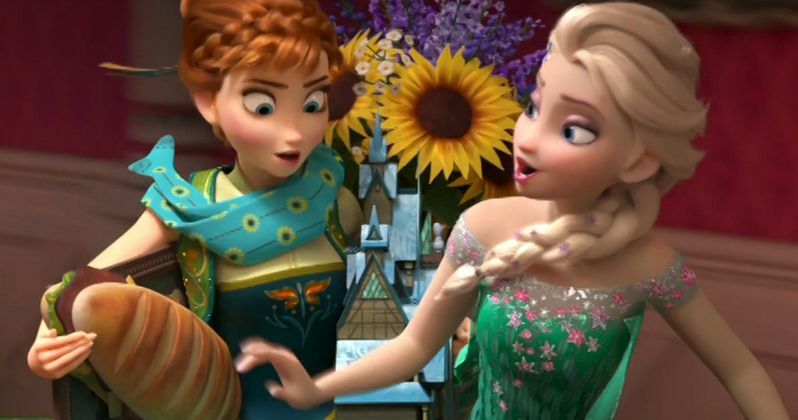 The sisters from Frozen are officially back in a first look at Anna and Elsa in Frozen 2. The image comes from an international calendar, and has been confirmed to be the real thing. Though, the sisters do look a little older than the last time we saw them. Frozen was originally released way back in 2013, and was an instant smash with fans and critics alike. It didn't take long before the movie and its hit single 'Let It Go' were a culture phenomenon. Disney knew they had a hit on their hands, but a sequel wasn't put into production right away. In fact, it took quite a bit of time and patience before a follow-up was even announced. Frozen scored big at the box office, bringing in over $1 billion worldwide. The movie is still the highest-grossing animated hit of all time, working from a $150 million budget. Now, in 2019, we will finally get to catch up with Anna and Elsa, but who knows what these sisters are up to this time around. Disney hasn't let any plot details slip, and they have remained relatively tight lipped ever since that Olaf extended short didn't go over too well in theaters. The original cast, which includes Idina Menzel, Kristen Bell, Jonathan Groff and Josh Gad, will all be back, singing new songs and telling new jokes. There are even some new cast additions, which include Evan Rachel Wood and Sterling K. Brown. These images were first noticed by The Hashtag Show. This artwork appears to come from a Russian calendar, and includes the Russian title Frozen Hearts 2. What can be gathered by this first look artwork is that fans should prepare for a significant time jump. It's expected that Arendelle has experienced a period of peace, with its people becoming accustomed to having a sorceress for a Queen. Fans will get to see how the Anna and Kristoff relationship has matured throughout the past couple of years. If the movie does a true 6 year time jump, young fans will get to resonate along with the passage of time they've experienced in their own lives, suggesting a more mature movie. There has been a big push by fans on social media to give Elsa a girlfriend, with Disney possibly giving one of its animated characters their first ever lesbian lover. Though it's unclear if Disney is ready to make that kind of leap in a kids movie just yet, suffering backlash from the suggestion of a gay character in their live-action Beauty and the Beast. From the looks of this image, which shows leaves blowing in the background, it's possible that this next adventure will take place in autumn instead of winter. There could be a season full of change and transformation. Else looks as though she may still be struggling with her powers. Her world could be changing, and perhaps she's not quite ready to deal with that. Frozen 2 will be in theaters just in time for Thanksgiving next year. The promotional push for the film should start happening soon. And we'll probably get the trailer early in the new year. For now, you can check out the leaked calendar image, and suss out whatever you think might be happening in this hugely awaited sequel, which is sure to be another major blockbuster for Disney.